The use of e-voting in universities is one of the paths taken by the countries that seek to modernize their electoral systems. Given the fact that future voters feel particularly attracted to the use of technology, achieving the empathy of the youth through automated elections could become one of the strengths in developing suffrage supported by technological tools. Find an analysis on the subject here. Ecuador has decided to improve its electoral system and is sparing no effort. At the same time that it is organizing an e-voting pilot for around one million voters—8% of the 11.6 million people on the voting registry—, it has also approved the use of a quick count modality (preliminary results) during the February 2014 elections. The National Electoral Council (CNE) has announced that it has approved the Quick Count Project and Operative Plan in cooperation with Dominican Republic’s Central Electoral Board in order to speed up the release of unofficial election results that year. In 2011, Ecuadorians had to wait two weeks to know the results of a referendum, which led to champion election automation. However, while the selection of the technology that will automate elections takes place, the use of machines from the Dominican Republic’s electoral body for the transmission of preliminary results will be allowed. 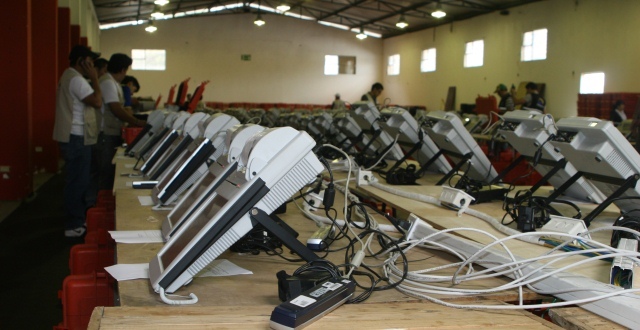 Paúl Salazar, CNE vice president, explained that 1500 devices (computers with scanner) will be used in 1300 electoral precincts around the country. The process involves scanning a certain number of minutes—around 40%—, which will be transmitted to a consolidation center in order to establish trends and to be able to announce unofficial results two hours after the polling stations close. Although quick count is not the best modality to use for the first results bulletin since the information obtained is unofficial until all results are tallied, Ecuador opted to seek a solution that allows to shorten the lapse of uncertainty on Election Day while the automation process takes place. This will be the experience with ballots cast nationwide except in the municipalities of Azuay and Santo Domingo de los Tsáchilas, where a pilot that seeks to leave manual voting behind will take place. Regarding this second novelty, it is known now that the e-voting pilot test will employ two different technologies. Azuay will use a system belonging to Argentina’s National Direction of Electoral Services, which consists of an electronic ballot box with smart ballots, while Santo Domingo de los Tsáchilas will test the Venezuelan model, due to the fact that this country agreed to lend its touchscreen machines that include the capability to print vote receipts on paper. The two experiences that Ecuador is preparing, quick count and election automation in two regions, show that in light of the erratic performance of manual voting, the nation has decided to use technology to offer its citizens the opportunity to have a system where a guaranteed vote is the rule and not the exception. The National Office for Electoral Processes (ONPE) in Peru approved the addition of a tab to enable null votes in the election of aldermen for the city of Lima, which will take place on November 24th. The electoral body explained that this new mode can only be used in case e-voting is authorized. Find the news here.